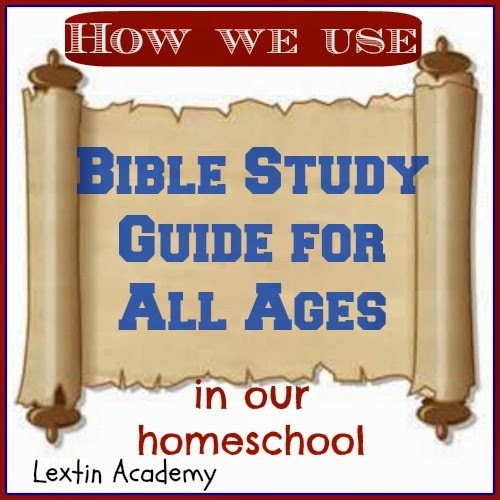 This is my 3rd year using Bible Study Guide for All Ages and we still love it! I enjoy how much I learn from it and my kids impress the socks off their Sunday school teachers with their Bible knowledge. Bible Study Guide for All Ages is a non-demoninational program for studying the entire Bible in a cycle of 4 years. There are multiple levels of study for various ages of children so that the entire family can study the same Biblical topics at the same time but at different levels of difficulty and depth. The program is divided into 4 units and each unit contains 104 daily lessons. Each unit covers different books or people of the Bible with some New Testament and some Old Testament topics each year. 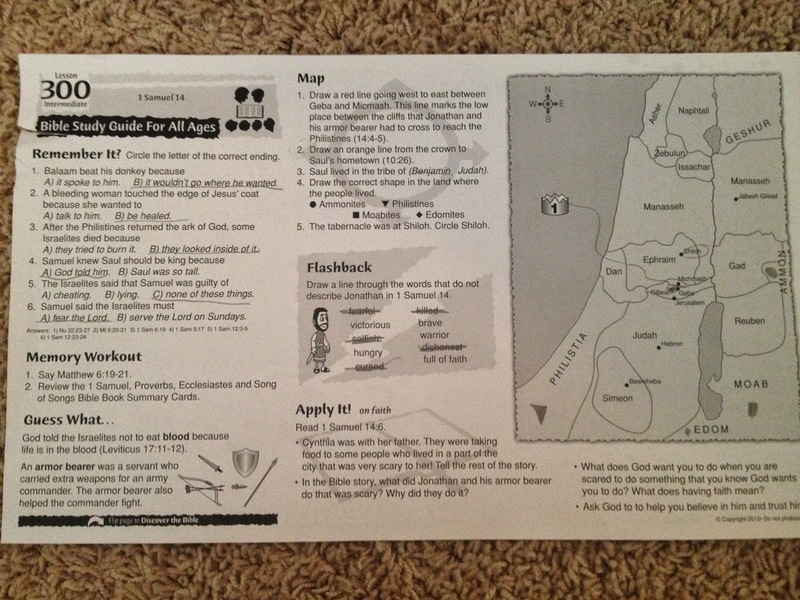 Bible Study Guide for All Ages contains worksheets for study. These pages have maps, timelines, application, review questions, and cartoon figures that illustrate the lessons. They are divided into categories for different ages: Beginner, Primary, Intermediate, and Advanced. Older students may prefer to work only from the teacher’s guide without the student pages. The guide has review questions, Scripture references to be read, definitions, and additional teaching helps for each passage. What do you need for the program? There are multiple components to the program and not all are necessary. You could easily teach the program with only the teacher guide, using the Scriptures as your reading source and asking the review questions. However, my kids love their own student pages so we use those daily. We use the beginner and intermediate pages. I have tried the primary pages and have found them more cumbersome to teach so we skip them entirely. Once my kids are ready they move directly into intermediate pages. 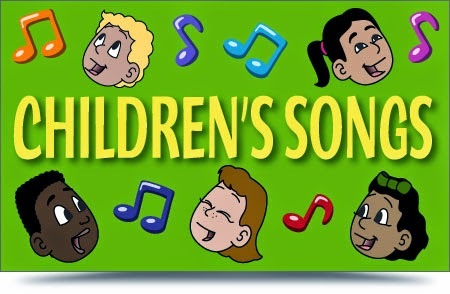 We have the song CD which is old fashioned Bible songs sung acapella. The Beginner Timeline is a great tool for review – especially for visual learners. 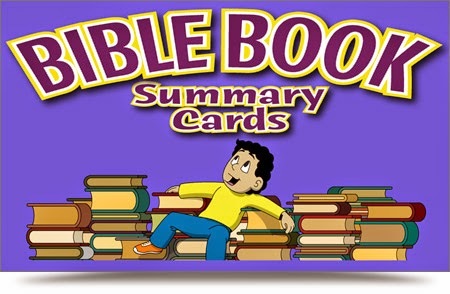 Recently we tried the Bible Summary cards and found those to be well suited for older elementary. They provide an excellent overview of the main people, themes, and events of each book of the Bible. We haven’t yet tried the timeline or maps since the intermediate pages contain their own timeline and maps. Does it cover the entire Bible? As we’ve worked through the different units I’ve noticed a few verses left out here and there. Usually they are ones that are really difficult to explain to younger kids and have to do with complicated Levitical laws or situations that are better left for older ages. However, the program does cover the majority of the verses in each book of the Bible. Sometimes I have to do a little editing on the fly as we read because some of the topics or words used (prostitute) are not quite what I’m ready for little ears to here. So, while not every verse is included, the program does not shy away from many of the difficult topics of sin, sickness, death, and war. 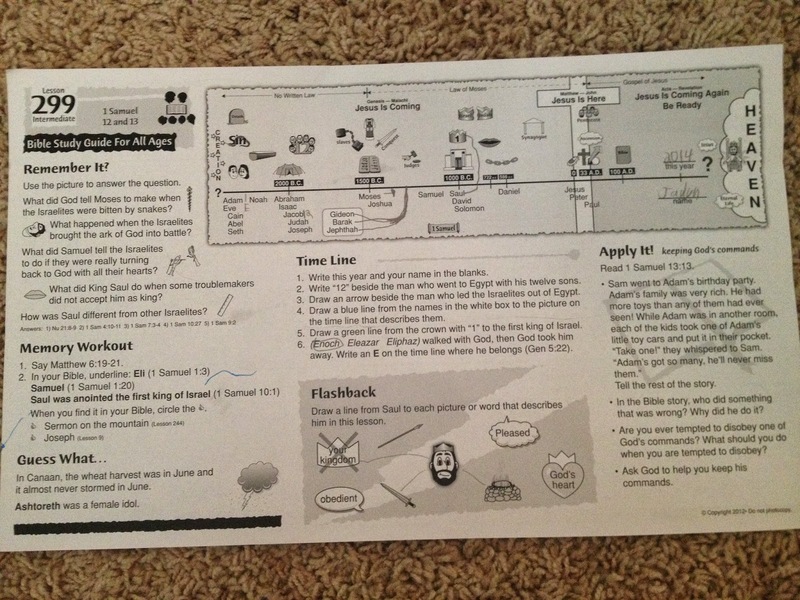 I appreciate that my kids get an excellent overview of the entire Bible through using all the units of this program. Does it teach in order? No. The program does not start at Genesis and move straight through the Bible or even cover the Bible in a chronological way. There are some books in both the New and Old Testament that are covered in each unit. Although the jumping from completing Hebrews to studying about Peter and Paul only to jump backwards into the Old Testament to the book of Judges can make me feel a little crazy, we’ve found that we enjoy the variety and sometimes need a break from heavier topics. I feel the program does a good job of covering Old and New Testament topics in each unit and covering both people of the Bible and historical events. Does it teach theology or worldview? No. This program sticks to the historical facts and people of the Bible without adding any extra commentary. That’s my job to add in and I appreciate the freedom to do so with this program! The program is a great survey of the Bible! How do we use the program with 2 levels? Every afternoon we gather in the homeschool room in beanbags on the floor. Each child has their own worksheet page and we share a giant tub of crayons. This year I had two children in the beginner level (Tiger – K and Bee – PreK) and one in the intermediate level (Curly – 2nd grade). I started off by reading the review questions on the front of the beginner pages while Curly works to complete her review section independently. Then we turn the page to the back and do the lesson. I read the summary for one cartoon box from the beginner pages and instructed Tiger and Bee what to color or complete from that box. (And no we don’t always use the colors suggested and sometimes I give them even more instructions for each box. We stay flexible with this). As they are working in that box and doing their coloring, I read the Bible verses to Curly and she completes her box. Back and forth I go between the beginner summaries and the Scriptures for Curly. When we are done with the story we turn back to the front of the page. I read the apply it section to Tiger and Bee while Curly does the short flashback section which contains a review from this lesson. While Tiger and Bee color the front picture, I help Curly with her map or timeline. At the end we sometimes sing the songs, look at the beginner timeline, or practice the Bible summary cards. The entire lesson takes us about 20 minutes. Initially it was a little tricky to switch back and forth between the two different student pages as I tried to read the lesson but we’ve now found a system that works for us. We enjoy studying the same Bible stories together! I can teach all of my children together and we learn the same Bible stories at the same time. 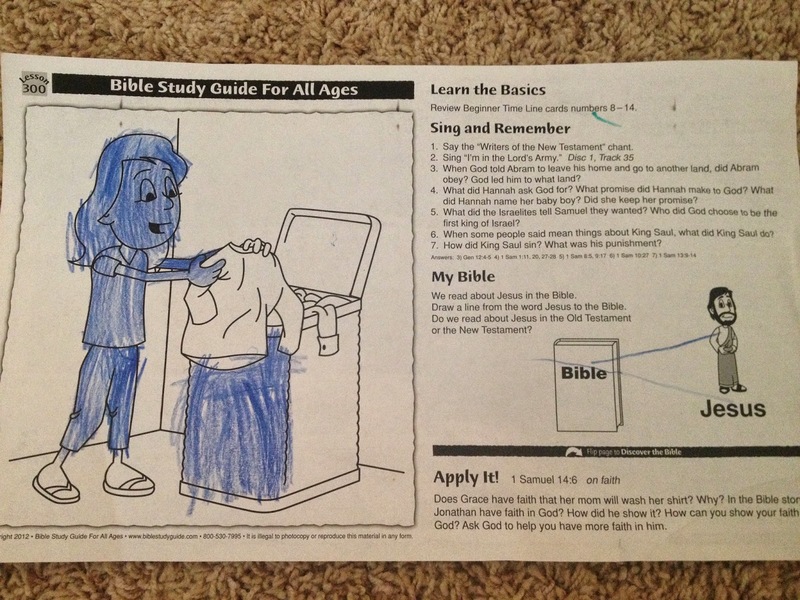 My kids learn more than just the typical stories covered in Children’s Bibles. This program covers even the more obscure events and stories from different books of the Bible. It is extremely easy to teach and requires no planning on my part. I use the student pages and we complete each section together. 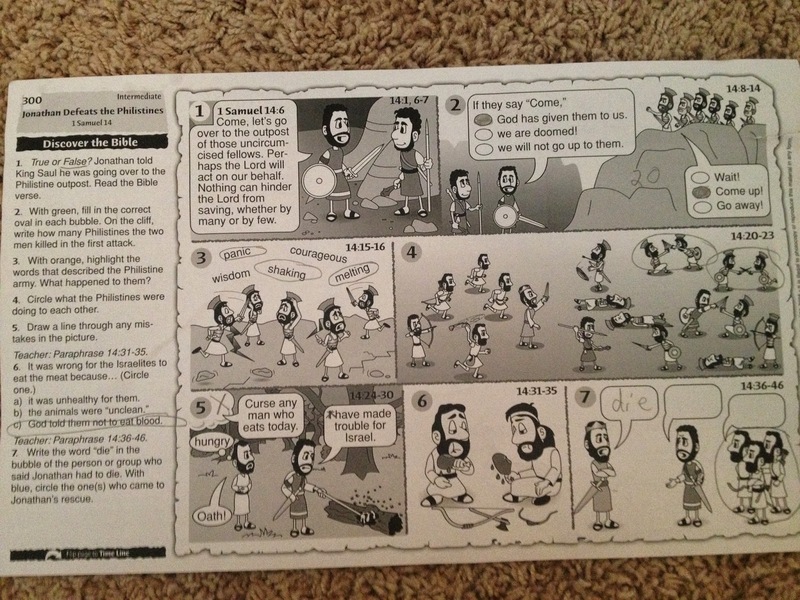 The younger pages include a summary of the Bible passages which is appropriate for younger learners. The source for the older elementary pages and above is the Bible itself. I love that the program directs us to read from our Bible and discuss the stories together. The cartoons are helpful illustrations. My kids love looking at the cartoon depictions of the stories and they really help them keep the various events and people straight as we read the stories. The program has excellent review. Each lesson starts with review questions so that my kids don’t forget what they learned in previous lessons or in previous units. The pages for younger kids have a section to help the kids apply what they’ve learned to their daily life. We love discussing those questions together. The intermediate pages alternate between maps and timelines which has given us a wonderful visual of the events of the Bible and when they took place as well as where they took place. The retention of the Biblical facts is amazing when using this program! My kids simply do not forget even the more minor details of each story. Each cartoon box illustration has specific instructions such as filling in the blanks, coloring a certain person, or completing what is missing from the scene. My kids loved being able to interact with their worksheets. And I’m hosting a giveaway for the Timeline Summary Cards and the CD! Enter below……must be a US resident to win. All entries will be verified. We love BSGFAA, my favorite story is of Paul's conversion. This looks great for more of a structured study than we are currently doing. Hope I win! I am always humbled by the account of Jesus healing the man born blind. We also love BSGFAA! Our favorite story is is Joseph. Such a great lesson in forgiveness. My son loves Sampson, my daughter loves to read about Jesus' death and resurrection. My two favorites are Esther and Ruth. My favorite Bible Story, funny the kiddos were asking me this the other day. I think one of them is Joseph.